When Jumeirah Zabeel Saray launched on the Palm Jumeirah in Dubai I was asked to be their Advertising Photographer to launch their luxurious lifestyle advertising campaign. Here below is my behind-the-scenes recall into one of my favourite hospitality advertising photoshoots with a client who was willing to take a chance. Jumeirah Zabeel Saray had a budget for 25 images to be photographed over 5 days. Within this number they had a handful of images that needed to be ‘covered’ for their own requirements. 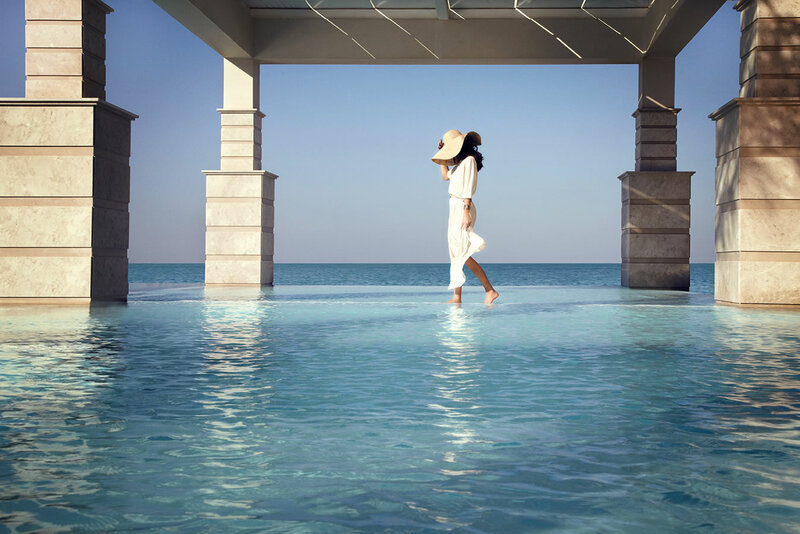 Once these handful of images were photographed my brief was to create a set of luxurious lifestyle images that would reflect the opulent interiors of Jumeirah Zabeel Saray to the affluent market. The images needed to be standout images completely unique from anything else in Dubai – yippee! My producer Joli and I headed to Jumeirah Zabeel Saray to do a recce of the location. Afterwards we compiled a short list of my recommendations to be shot, a storyboard to present along with suggested international models and the team I would require to make this photoshoot come alive. In the initial stages of brainstorming for Jumeirah Zabeel Saray I wore the Creative Director hat. Once I had a clear vision of what I wanted I brought in my preferred choice to run with my ideas, Ryan, an extremely talented Creative Director whom I knew would be able understand my creative ideas while I focused on being the Photographer. Over 5 days of early mornings and late nights my team and I worked together to photograph some of the most cutting edge and unique visuals for a hotel Dubai was yet to see. This advertising campaign for Jumeirah Zabeel Saray are the results of a client willing to take a risk with a project and believing in the creativity of the team.